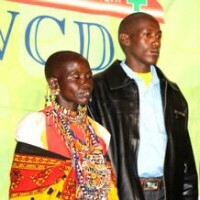 NAIROBI, KENYA(ANS) — A Kenyan woman who was seriously injured when attacked by a buffalo, was later healed by the power of God, brought an audience of 500 doctors and medical professionals from 37 countries to their feet at a unique conference in Nairobi, Kenya. She said that early the next morning they returned to the village of Osarara and as they came to the bottom of the hill a woman came running towards them shouting, “Kanasa is healed! Kanasa is healed!”Hales’s message said, “Behind her, walking down the hill without a limp or an impediment came Kanasa, on her face a huge smile! Her leg was truly healed and the hole where the horn had entered had closed completely. The broken skin on her forehead had also closed and there was no sign of infection anywhere. It was then when Dr. Ngumi announced that Kanasa was in the hall, and everyone rose to their feet as this slight woman walked to the front and onto the platform and waved to the audience. This was just one of many miracles documented during this conference, which will, next year, be held in Mexico City, Mexico.